Preliminary design plan prepared for the General Board during consideration of designs to be included in the Fiscal Year 1914 program. 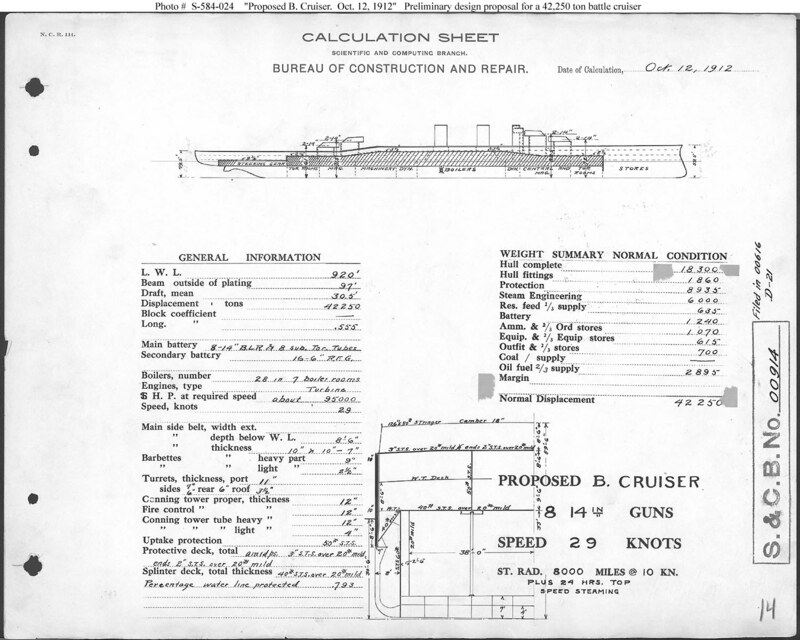 The General Board recommended that two battle cruisers be requested for Fiscal Year 1914 and the Secretary of the Navys staff developed characteristics that guided this design, which was forwarded to the Secretary of the Navy on 19 October 1912. Ultimately, however, the Navy requested only one battleship of standard design in Fiscal Year 1914, which became Arizona (Battleship # 39). Battle cruiser construction was not authorized until funding was provided under Fiscal Year 1917 authority (see Photo # S-584-102). 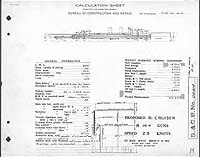 This plan provides eight 14-inch guns, turbine machinery and a speed of 29 knots in a ship 920 feet long on the load water line (L.W.L. ), 97 feet in beam, with a normal displacement of 42,250 tons. Note: The original document was ink on paper (black on white).